Instead, the animators are the stars here, and the task of bringing the characters to life rests entirely on their shoulders. For the most part, they succeed. Shaun the Sheep Movie isn’t as narratively clever or formally ambitious as past Aardman efforts like Chicken Run, The Curse of the Were-Rabbit (Wallace and Gromit’s first and, sadly, only feature) and even The Pirates! Band of Misfits. But it’s a solid showcase of the studio’s stop motion craft and a good modern gateway into the joys of silent comedy for younger viewers who are perhaps suspicious of black and white masters like Charlie Chaplin and Buster Keaton. The film’s straightforward plot certainly doesn’t require any additional blather to explain. Bored of his daily, weekly and monthly routine, Shaun hatches a plan to enjoy some much-needed R&R from the grinding sameness of farm life. But his plot backfires when his owner winds up on a runaway camper that careens from the countryside into the big city, ultimately receiving a knock on his noggin that robs him of his memory. In his absence, the farm descends into chaos, leading a guilt-ridden Shaun to embark on a search-and-rescue mission that that his sheep pals and the resident sheepdog join in on. Once again, things don’t go according to plan and the animals are forced to improvise their way out of various jams without being captured by a zealous animal control officer who loves his job a little too much. That narrative gives the Aardman animation team, overseen by directors Richard Starzak and Mark Burton, plenty of room to choreograph silent set-pieces, the best of which include an extended sequence in a fancy restaurant where the sheep don human clothing and try to adopt human table manners with little success, a spirited rooftop chase and a final race back to the farm. And it’s a good thing that the characters are constantly in motion, because that helps distract from the fact that—cute factor aside—Shaun isn’t a particularly interesting hero. There’s a wide charisma gap separating him from Wallace and Gromit or the hens of Chicken Run (not to mention Chaplin’s Little Tramp or Keaton’s Great Stone Face), one that becomes apparent whenever the movie takes a breather in between stop-motion stunt work. Then again, unlike Wallace and Gromit (or, for that matter, Chaplin) whose antics appeal to all ages, Shaun is geared towards the younger set, which is probably why my 4-year-old had a better time at the movie than my 8-year-old overall. The best silent comedies had another level beyond mere clowning; Chaplin’s movies always hinged on sweetly emotional (some would say cheesy) relationships, while Keaton presented himself with ambitious formal challenges, like entering a movie screen (Sherlock Jr.) or driving a train over a burning bridge (The General). 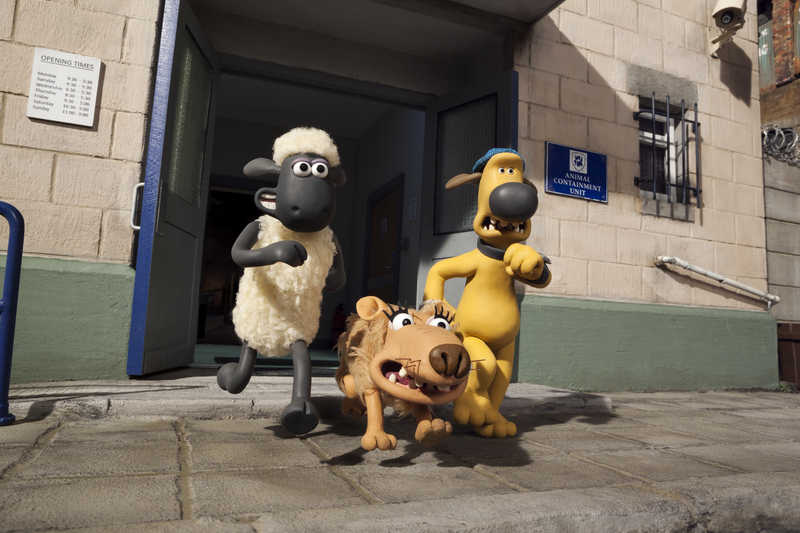 And while Shaun the Sheep Movie makes overtures towards deeper dramatic stakes (like a subplot involving a stray animal who the sheep adopt as a friend), the filmmakers are happier to just entertain. They accomplish that from moment to moment, but they don’t leave viewers—even young ones—with very much to remember.